The Ultrastar He6 is a great display of how helium injection leads to lower hard disk power consumption and storage capacities. But unfortunately, the Ultrastar He6 can't beat its competitors in performance. Seagate's 6TB hard disk is considerably faster and it seems, slightly quieter too. It may be up for debate whether HGST or Seagate has sold the world's first 6TB (6000GB) hard disk, but there's no arguing over HGST's claim to the title of being the first company to produce a hard disk containing helium, rather than air, inside its shell. According to the company, which is a subsidiary of Western Digital, by using helium, the reduced air friction means less resistance than you'll find in a standard hard disk, allowing more headroom for increased disk speed, additional platters, and lower power consumption. Since the 6TB HGST Ultrastar He6 and Seagate Enterprise disks have arrived almost simultaneously, a direct comparison is inevitable. Seagate has boosted its drive's capacity without developing friction-reducing technology though, instead relying on improved platter density for higher capacities. The comparison therefore is between technology as much as it is between products. 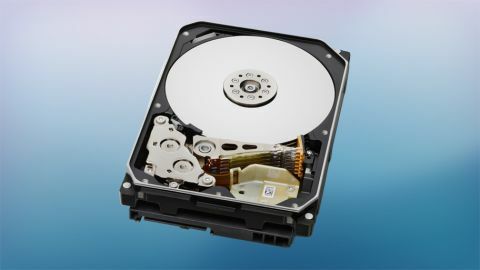 The only variances between the four HGST Ultrastar He6 models are in its connector - 6GB/s SATA or 6GB/s SAS, and whether or not it comes with hardware encryption. No capacities are offered besides 6TB at this stage. As with the Seagate Enterprise 6TB hard disk, the Ultrastar He6 spins at 7200RPM, but it only has 64MB cache, while Seagate has bumped its cache to 128MB. Gb/sq. in. Platter density is one of the most important specifications for a hard disk, since it defines not only capacity, but performance. As the head moves across the disk to read or write data, if more information is packed into the same space, more data is read than with a disk that has a lower platter density. With the SATA model, there's only the option of 512n sectors, while the SAS model allows for 512, 520 and 528, but not 4Kn, as with the Seagate Enterprise 6TB disk. Another notable difference is in power consumption. Seagate quotes its 6TB drive consumes 11.27w in use, with 6.9w when idle. The Ultrastar He6 uses considerably less power though - either 7.3w or 8.8w in use depending on whether it's the SAS or SATA model, and either 5.3w or 5.7w when idle. When it comes to price the HGST Ultrastar He6 Helium is slightly more expensive than Seagate's 6TB hard disk at most online retailers. Both drives hover around the £450 mark, although if you shop around they can be found cheaper at many retailers. Helium has never been used in hard disks before, and therefore, is an unknown quantity when it comes to long-term reliability, which is a crucial factor for all users, but especially enterprise and data centre customers. The Ultrastar He6 carries a 5-year warranty, and HGST states an impressive 2 million hour MTBF (mean time before failure) but as always, this figure is calculated from algorithms rather than actual testing. There's no real way to test whether the drives are more or less reliable than traditional disks, without the benefit of long-term use and deployment. But if there's a possibility the technology is an additional risk for IT managers, who are notorious for sticking to tried and tested products, it could end up being shunned until more information is known. I used CrystalDiskMark, AS SSD and PCMark 08 to gauge the performance of the Ultrastar He6. The Ultrastar He6 delivered lower sequential read and write performance than Seagate's drive in CrystalDiskMark. Read speeds were at 163 MB/s, with write speeds at 158 MB/s, which is significantly lower than Seagate's respective 223 MB/s and 217 MB/s. With random performance the Ultrastar fell slightly short too. With 56MB/s read speeds and 55MB/s write speeds, performance was lower than the Seagate Enterprise v4 6TB hard disk, which managed 62 MB/s and 121 MB/s. Read access times are longer too - AS SSD reported 13ms, compared with 11ms with the Seagate, but access times were twice as fast while writing, at just 2ms compared with 4.1ms with the Seagate. In PCMark, an overall score of 3725 indicates that, despite the lower performance, the HGST Helium He6 still works very well as a main system drive, since the Seagate was only two points higher, with a score of 3727. Although the storage test showed the differences clearly, with the HGST Ultrastar He6 scoring 2890, compared with the Seagate's 3095. Overall, there's nothing at all wrong with these results, and it's safe to say the HGST Helium He6 is a good drive, but it's beaten soundly in tests by Seagate's traditional air-filled Enterprise V4 hard disk. The other aspect of testing I conducted was a rough sound test, using a smartphone decibel metre. This isn't a completely accurate test, but if used to compare two devices in an identical environment, it is at least an indicator of noise levels. I set a large file transfer going and measured the ambient noise levels on top of both the Seagate and HGST drives. The HGST was a full 5DB louder than the Seagate. The HGST Ultrastar He6 promises a lot, especially as it is the first hard drive to contain helium. But does it live up to that innovative design? Overall performance is adequate, but suffers slightly when compared to Seagate's competing product and while 6TB might be an attractive level of storage it does come with a high price tag. Any 3.5-in hard drive offering 6TB of capacity is a winner. Home users can squeeze more movies, music and media onto it, and business customers can look forward to upgrading their storage capacity by at least 50%, without having to accommodate more rack space. It's performs well too. Although I found Seagate's Enterprise v4 6TB hard disk to be faster, the HGST Helium He6 is still good in the all-important speed tests. It also has a five-year warranty, which is much longer than you get with most consumer hard disks. Long warranties are expected of enterprise storage devices, and it's a tradition I'm very pleased to see continue. 6TB hard drives aren't good value for money at this stage, especially these enterprise drives, which are a lot more than the average consumer hard drive. You're much better off buying multiple drives with a smaller capacity, than a single 6TB model, for now. In use, I found the drive got quite hot, and was measurably noisier than its Seagate rival. Despite the overall lower performance, I'm cautiously optimistic about HGST's approach with the HGST Helium He6. With its lower internal friction, it could lead to continued storage improvements in the near future, as soon as HGST can match it rivals' high platter density. Lower power consumption no doubt helps as well. While other firms who are still filling disks with air might be stuck with lower capacities for longer, HGST is now poised to rush ahead of them, although for now, these benefits are yet to be fully realised.